When US Secretary of State John Kerry announced that talks about talks to revive peace negotiations between the Israelis and Palestinians would begin soon in Washington, veteran commentators greeted the news with scepticism. 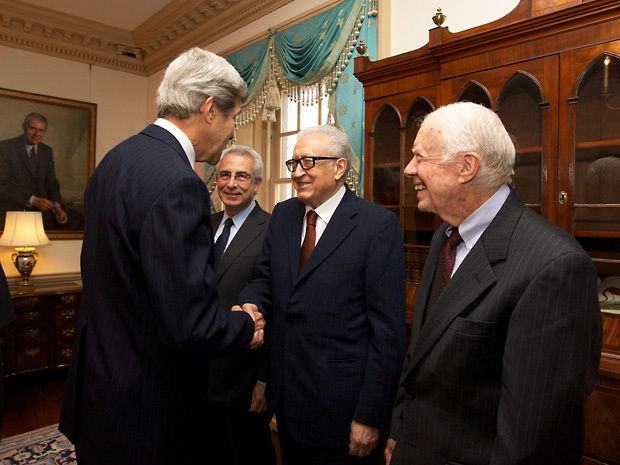 However, three elder statesmen, former US president Jimmy Carter, former president of Finland, Martti Ahtisaari (both Nobel Peace laureates) and former Algerian foreign minister Lakhdar Brahimi (currently the Joint Special Representative of the UN and League of Arab States for Syria) seized on Kerry’s initiative as a genuine opportunity. Speaking to a packed audience of diplomats, journalists and regional specialists at a meeting I chaired at Chatham House on Wednesday, these three members of the group founded by Nelson Mandela in 2007, known simply as “The Elders” and dedicated to working for peace and human rights around the world, claimed that Kerry’s strategy holds more promise of reviving the possibility of a “two-state solution” to the Israeli-Palestinian conflict than that pursued by the Americans in President Obama’s first term. The Elders commended Kerry for his painstaking, behind-the-scenes diplomacy over many weeks and his preference for secrecy over public bargaining about the terms of engagement. The Palestinian leader, Mahmoud Abbas, had stipulated that talks could not resume unless and until the Israelis ceased the expansion of Jewish settlements in the Occupied West Bank. The Israeli leader, Binyamin Netanyahu, had said that there should be no mention of the 1967 borders between Israel and the West Bank as the basis for negotiations. Whether either condition has been accommodated in the framework for the prospective talks has not been clarified. Carter identified this lack of clarity as a positive sign, insisting that real progress can only be made when neither party is obliged to stick rigidly to parameters laid down by their respective political allies and supporters back home. As it is, members of Netanyahu’s governing coalition in Israel have already made it known that they would desert the coalition if he conceded to the main demands of the Palestinians for a viable independent state, including a capital in East Jerusalem and a formula for recognising the “Right of Return” for the refugees who fled what became Israel in 1948. On his side, in the run-up to Kerry’s announcement, Abbas faced fierce opposition from officials of the Palestine Liberation Organisation (PLO) to any resumption of negotiations without a settlement freeze. Yet, drawing on his own experience of shepherding negotiations between the Israeli prime minister Menachem Begin and Egyptian president Anwar Sadat at Camp David in 1978, Carter believes such leaders can be coaxed to forge a deal by the prospect of attaining a place in history as the statesman who delivered their country from the grip of enduring conflict. Add to that the reward of a Nobel Peace Prize and any leader can be persuaded to face down his detractors back home. Elaborating on this point, Carter told us that when Sadat and Begin arrived at Camp David with their respective entourages of 40 or so aides, to deter them from conferring with their colleagues back home or speaking to the media, they were informed that all the phones were being bugged. It was not true, he said, but the ruse worked, apparently. He also volunteered that Sadat’s aides were more hard-line than their president, while the members of the Israeli delegation were more amenable to concessions than was Begin himself. What finally convinced Begin to take the plunge, Carter said, was a phone call to none other than Ariel Sharon. To succeed, the talks promised by Kerry can only pave the way for a top-level summit – but, having met with Kerry just two days before they arrived in London to galvanise support for his efforts, all three Elders are convinced that Kerry has the full backing of President Obama. 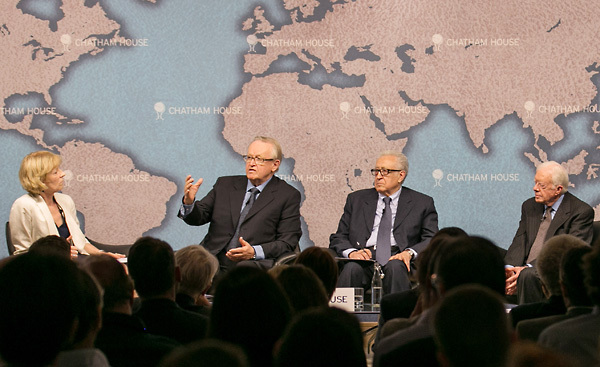 Ahtisaari also emphasised the necessity for all the international players involved in the quest for a two-state solution to co-ordinate their efforts through Washington and not complicate the process with independent initiatives. The move by the EU to ensure that future funding for scholarships and projects awarded to Israelis exclude those emanating from or involving Jewish settlements in the West Bank was greeted with outrage in Israel. However, the decision did help to encourage the Palestinians to at least entertain the idea of renewed talks about conflict resolution. And all the Elders believe that if resumed negotiations could produce a two-state formula acceptable to the Palestinians, critics of all peace efforts to date, across the Arab world and in Iran, would not stand in their way. The Elders have been in dialogue with Hamas leaders and claim that the latter have said that if the PLO comes up with a deal and this is approved by the Palestinians in a referendum, they will go along with that. Carter commended Kerry for not letting the rivalry between Hamas and the Fatah movement headed by Abbas deflect him from his purpose. He and his colleagues explained that successive Egyptian efforts to reconcile the two factions had been deliberately derailed by intervention from Washington, prompted by Israeli pressure. Their advice therefore is to defer dealing with the question of internal Palestinian divisions until later. The Arab Peace Initiative of 2002 (re-launched in 2005), whereby all the members of the Arab League pledged to support an agreement ending Israeli occupation of land captured by Israel in the 1967 war and a just settlement for Palestinian refugees was recently reaffirmed. Kerry suggested the Israelis take it seriously. Notwithstanding the confusion surrounding the representation of Syria in the Arab League, Brahimi believes the support of Arab governments for a resolution of the Israeli-Palestinian conflict will be forthcoming. Brahimi’s argument, endorsed by Carter and Ahtissari, is that the resolution of that conflict is long overdue, the denial of Palestinian rights is indefensible and the region desperately needs peace. A two-state solution is the only way to end the conflict and without it there will only be more violence, suffering and instability – something the Elders believe – cannot be in Israeli, Arab or international interests. In the audience at Chatham House on Wednesday there were sceptics and many questioners pointed out the numerous obstacles to be overcome. Yet Kerry could not be better served than by the determination and inspirational commitment of the three distinguished elder statesmen to galvanise support for his efforts. On Wednesday at least, no one dared suggest openly that they were naïve or misguided. Rosemary Hollis does not work for, consult to, own shares in or receive funding from any company or organisation that would benefit from this article, and has no relevant affiliations.